Preservation Hall - a concert hall in the French Quarter that began as a jazz performance space supported by artists, musicians, and civil rights activists in 1962. Preservation Hall is a French Quarter concert hall with nightly performances by esteemed local jazz musicians. Established in 1962 by young Philadelphia natives Alan and Sandra Jaffe, the space provided a safe place for older jazz musicians to perform in New Orleans at a time when state laws prohibited inter-racial performances. 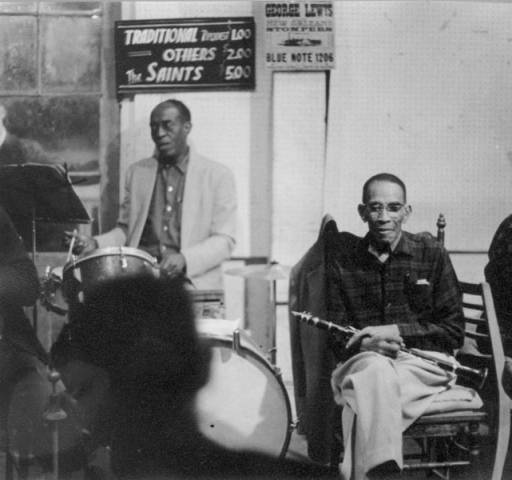 After the Civil Rights Act of 1964, Preservation Hall became widely known as a family-friendly concert hall in which New Orleans-style jazz is performed nightly. Through recordings, tours, and film the Preservation Hall band gained international recognition, and continues to present New Orleans music traditions to the world today.. Still family run for over 50 years, Preservation Hall hosts performances 350 nights a year, and includes educational programs aimed at preserving the legacy of Jazz in New Orleans. "George Lewis at Preservation Hall. New Orleans, Louisiana." ~ Date: 1966. Clip of Preservation Hall Recording. 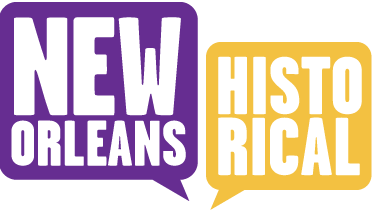 Louisiana State Museum, “Preservation Hall,” New Orleans Historical, accessed April 19, 2019, https://neworleanshistorical.org/items/show/1311. The Preservation Hall Band pose outside of Preservation Hall, 1967, From left: clarinetist George Lewis, trumpeter Dede Pierce, seated pianist Billie Goodson.